Many B2B manufacturers and distributors believe that they must improve their quote or order-management systems to really benefit from a pricing-improvement effort. They may even have the misguided notion that implementing a better quoting tool will somehow lead to better realized prices in the marketplace. As a result, these companies end-up allowing their in-house quoting tools to become a gating factor to improving their profits. Some companies, however, adopt a very different stance. They want results now, and know that simply improving the quotation system alone won't do it. They also know that replacing a quoting tool is not something fast or painless. These firms realize that by integrating optimal prices with their current quotation system they can generate big profit gains in record time. This paper exposes how one company concluded that replacing its old green-screen quoting application would not only be painful and time-consuming; it would do little to actually improve the quality of the prices being quoted. 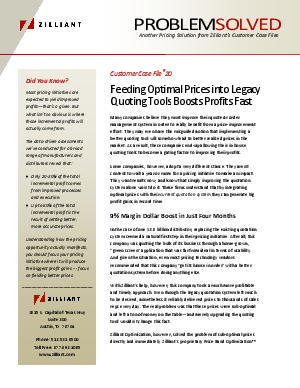 And how, by using technology to optimize the prices that would ultimately populate their legacy quoting tools, this company was able to quickly produce significant margin-dollar gains, with no change to existing sales processes.